The Ontario Provincial Police (OPP) is the provincial police service for the province of Ontario, Canada. In the late 1940s, policing functions were reorganized in Ontario, with the OPP given responsibility for all law enforcement in the province outside areas covered by municipal police forces, together with overall authority for law enforcement on the King's Highways, enforcement of the provincial liquor laws, aiding the local police and maintaining a criminal investigation branch. The OPP is responsible for providing policing services over one million square kilometres (390,000 sq mi) of land and 174,000 km2 (67,200 sq mi) of water to a population of 2.3 million people (3.6 million in the summer months). As of 2010, it has over 6,200 uniformed, 850 auxiliary, and 2,700 civilian personnel. The vehicle fleet consists of 2,290 vehicles, 114 marine vessels, 286 snow and all-terrain vehicles, two helicopters, and two fixed-wing aircraft. Rank structure within the OPP is paramilitary or quasi-military in nature, with several "non-commissioned" ranks leading to the "officer" ranks. The OPP is the largest deployed police force in Ontario and the second-largest in Canada. It is responsible for providing policing services throughout the province in areas lacking local police forces. It also provides specialized support to smaller municipal police forces, investigates province-wide and cross-jurisdictional crimes, patrols provincial highways, and is responsible for law enforcement on many of the province's waterways. The OPP also works with other provincial agencies, including the Ministry of Transportation and Ministry of Natural Resources, to enforce highway safety and conservation regulations, respectively. Finally, OPP officers provide security at the Legislative Assembly of Ontario in Toronto. The OPP is one of three provincial police forces in Canada. The others are the Royal Newfoundland Constabulary in Newfoundland and Labrador and the Sûreté du Québec in Quebec. At the First Parliament of Upper Canada in Niagara-on-the-Lake on September 17, 1792, a provision was made for the formation of a "police system". Initially, policing jurisdictions were limited to districts, townships, and parishes. In 1845, a mounted police force was created in order to keep the peace in areas surrounding the construction of public works. It became the Ontario Mounted Police Force after Canadian Confederation. In 1877, the Constables Act extended jurisdiction and gave designated police members authorization to act throughout the province. The first salaried provincial constable appointed to act as detective for the government of Ontario was John Wilson Murray, hired on a temporary appointment in 1875 and made permanent upon passage of the 1877 act. Murray was joined by two additional detectives in 1897, marking the beginnings of the Criminal Investigation Branch. However, for the most part, policing outside of Ontario's cities was non-existent. With the discovery of silver in Cobalt and gold in Timmins, lawlessness was increasingly becoming a problem in northern Ontario. Police constables were gradually introduced in various areas, until an Order in Council decreed the establishment of a permanent organization of salaried constables designated as the Ontario Provincial Police Force on October 13, 1909. It consisted of 45 men under the direction of Superintendent Joseph E. Rogers. The starting salary for constables was $400 per annum, increased to $900 in 1912. The first OPP detachment was located in Bala. In the 1920s, restructuring was undertaken with the passing of the Provincial Police Force Act, 1921. The title of the commanding officer was changed to "commissioner" and given responsibility for enforcing the provisions of the Ontario Temperance Act and other liquor regulations. Major-General Harry Macintyre Cawthra-Elliot was appointed as the first commissioner. The OPP's first death in the line of duty occurred in 1923, when escaped convict Leo Rogers shot and killed Sergeant John Urquhart near North Bay. Rogers, who was later killed in a shootout with OPP officers, had already mortally wounded North Bay City constable, Fred Lefebvre. The first OPP motorcycle patrol was introduced in 1928, phased out in 1942, and then reintroduced in 1949. The first marked OPP patrol car was introduced in 1941. During World War II, the Veterans Guard was formed. This was a body of volunteers (primarily World War I veterans) whose duty was to protect vulnerable hydroelectric plants and the Welland Ship Canal under the supervision of regular police members. In the late 1940s, policing functions were reorganized in Ontario, with the OPP given responsibility for all law enforcement in the province outside areas covered by municipal police forces, together with overall authority for law enforcement on the King's Highways, enforcement of the provincial liquor laws, aiding the local police, and maintaining a criminal investigation branch. Women joined the uniformed ranks in 1974. In 1994, as part of a tripartite agreement between the government of Canada, the Province of Ontario, and the Nishnawbe Aski Nation, the OPP began the process of relinquishing a majority of northern policing duties to the newly created Nishnawbe-Aski Police Service (NAPS). The transition was complete on April 1, 1999, when the OPP's Northwest Patrol was transferred to NAPS. The OPP still administers first nations policing for Big Trout Lake, Weagamow, Muskrat Dam, and Pikangikum. The Ontario Provincial Police (OPP) provide policing services to areas of Ontario not policed by a regional or municipal police service. Municipalities can also be policed by the OPP under contract, with 323 as of 2019. Some detachments also host satellite detachments that provide policing to a local area, covering more than one million square kilometers, approximately 128,000 kilometers of provincial highway, and a population of over 13 million people. The OPP General Headquarters is currently located at 777 Memorial Avenue in Orillia at the Lincoln M. Alexander Building. The relocation of general headquarters to Orillia was part of a government move to decentralize ministries and operations to other parts of Ontario. Previously, from 1973 to 1995, the headquarters were located in Toronto at 90 Harbour Street, the site of the former Workmen's Compensation Board building. Previously, the OPP was divided into seventeen different regions. In 1995, OPP operations were amalgamated into six regions, with five providing general policing services, and one providing traffic policing services in the Greater Toronto Area following recommendations by the Ipperwash Inquiry.. OPP police stations are known as "detachments". The Legislative Security Service consists of special constables who provide security services to the Legislative Precinct (Legislature Building and Whitney Block) and report to the sergeant-at-arms. Officer uniforms consist of white shirt, black tactical vest, radio, black pants with yellow stripe and peaked cap. The majority of policing services are provided by uniformed front-line police constables. All sworn members of the OPP, as per the Police Services Act, must attend the Ontario Police College in Aylmer, Ontario, for thirteen weeks to obtain their Basic Constable Training Diploma. The OPP also mandates additional training before and after attendance at the Ontario Police College, resulting in the longest training period among Ontario police services. After this, probationary police constables are assigned to a detachment within the OPP's six regions with a coach officer for a year of field training. At the end of probation, a decision is made regarding retention. The OPP conducts training at the Provincial Police Academy in Orillia, Ontario. The current academy was opened in 1998 on the site of the former Huronia Regional Centre. Previously, training was conducted at the OPP Training and Development Centre in Brampton, Ontario, from 1981 to 1998. Uniquely, the OPP also has the mandate to train First Nations constables from OPP administered first nations police services. Members of these services undergo the same training as OPP constables, save a different uniform. Academy attendance is not open to the general public. Uniformed non-commissioned OPP officers wear dark blue uniforms with gold lettering and shoulder flashes. Commissioned officers wear a different shoulder flash, and white shirts. Since 1985, wide, light blue stripes down the side of issued trousers have been standard, and forage caps are banded with a hat band of the same colour. Officers wear duty belts with issued equipment, and have the option of wearing either an internal ballistic vest, or an external tactical vest with MOLLE webbing and large placards indicating "police" on their chest and back. The OPP was the first major police service in Canada to issue tourniquets and trauma equipment to each officer. Previously, officer were issued light blue shirts instead of their current navy blue shirts. These shirts are now reserved for use by special constables, security officers, and auxiliary police constables. From 1997 to 2008, the official headdress of the OPP was the stetson, though commissioned ranks were still issued the forage cap. Starting in 2008, the OPP returned to the peaked cap for all officers. Officers in a specialized role will be issued different equipment, such as baseball caps. Officers serving with a specialty tactical unit may also be issued cargo pants without the distinctive stripe, a utility top, and subdued placards for their external tactical vest. Officers serving with the Tactics and Rescue Unit are issued olive green uniforms. Rank structure within the OPP is paramilitary or quasi-military in nature, with several "non-commissioned" ranks leading to the "officer" ranks. Detective ranks fall laterally with the uniform ranks and is not a promotion above. Police constables in the OPP are uniquely known as "provincial constables". Auxiliary members have no police authority. They must rely on the same arrest provisions as regular citizens. There are some instances when an Auxiliary member may have the authority of a police officer. This can occur in an emergency situation, or where the OPP requires additional strength to assist with a special event. Auxiliary officers are unpaid, however are compensated for travel and meals. They are required to attend routine training administered by the OPP, and must contribute a certain number of hours monthly. The auxiliary is made up of people from diverse backgrounds. Auxiliary members are trained at the Provincial Police Academy and qualified with all use of force options. The auxiliary uniform is distinct from the uniform of a regular OPP officer. Auxiliary officers wear light blue shirts, checkered hat bands, and have their own cap badges. They wear slip-ons with the word auxiliary embroidered on them, and their jackets and dress uniforms have tabs sewn on that indicates that they are auxiliary officers. Following the disbanding of World War II asuxiliary forces, growing Cold War tension and fear of a nuclear attack led to the belief that police services should "recruit and train volunteers to augment their strength in times of emergency". As a result, in 1954, the Provincial Civil Defence Auxiliary was created, but the need to more closely associate the auxiliary with the OPP soon became apparent. On January 14, 1960, the Provincial Civil Defence Organization was dissolved. A new oversight body known as the Emergency Measures Organization—Ontario (EMO) came into being. Each department of the government became responsible for its own operational planning. The organization of auxiliary police forces became the responsibility of all interested municipal police forces, as well as the OPP. In April 1960, a new organization more closely affiliated with the OPP came into being. The Ontario Auxiliary Police were organized in 12 of the 17 OPP districts and by the end of the year, 376 volunteers had signed up to be equipped and trained by experienced OPP personnel. Two OPP inspectors were assigned to work with Emergency Measures Ontario as liaison officers for the volunteers. This close connection continues today with the OPP auxiliary playing a critical role in emergency and disaster planning and occurrences. By 1961 there were 466 auxiliary volunteers who accompanied regular provincials on traffic and law enforcement patrols and during the year logged more than twenty-six thousand hours of volunteer duty. In March 1969, a meeting took place at the Ontario Securities Commission in Toronto, Ontario, to incorporate a separate but included group of the Ontario Provincial Police Association. Membership is open to retired and currently serving members but also to civilian and auxiliary members. The OPP has approximately 1,200 cruisers in service across the province. Officers use all-wheel drive versions of the Ford Taurus, Ford Explorer, Dodge Charger and Chevrolet Tahoe for front line patrol. For specialized roles, a variety of vehicles are used, such as the Cambli International Thunder 1 armoured rescue vehicles used by the Tactics and Rescue Unit. Previously, models of the Ford Crown Victoria and Chevrolet Impala were used. 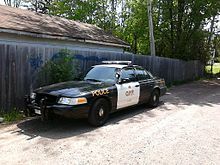 Historically, from 1941 to 1989, the OPP livery was black and white. In 1989, in response to manufacturers no longer offering dual tone vehicles, the OPP switched to an all-white livery with blue and gold striping. Vehicles of this era were equipped with federal signal vector light bars with integrated traffic advisers. In 2007, the OPP announced that it would return to a black and white colour scheme. The colour scheme is accomplished with the use of vinyl wraps during in-house vehicle outfitting. The change was implemented starting in March 2007 and was completed in 2009. Vehicles of this era had detachment markings on the rear quarter panel and used Federal Signal Arjent S2 light bars. Current vehicles have eschewed the detachment markings and are equipped with Whelen Legacy light bars. All marked cruisers are equipped with pushbars. Ontario Provincial Police constables are armed and carry a variety of use of force equipment in the performance of their duties. The current sidearm of the OPP is the Glock 17M pistol in 9x19mm. Previously, officers were issued either the Sig Sauer P229 DAO, or the P229R DAK in .40S&W. Patrol vehicles are also equipped with the Colt Canada C8 patrol rifle in .223 Remington, with the option of the Remington 870 in 12 gauge. All uniformed officers carry Taser X2 conducted energy weapons. The Beatles's 1967 album Sgt. Pepper's Lonely Hearts Club Band contains cover art with Paul McCartney wearing an OPP patch on his fictional uniform (more easily seen in the gatefold picture). In January 2016 the origins of the patch was confirmed as a gift from an OPP corporal on September 28, 1964, at Malton Airport as the Beatles were on their way to Montreal. On the online social networking website Habbo Hotel Canada, OPP officers and spokespersons visit the online application to talk to teens on board the web site's "Infobus". During the weekly sessions, users of the Habbo service are able to ask the officers and spokespersons questions, primarily regarding online safety. Starting in 2016, the Discovery Channel reality TV series Heavy Rescue: 401 began following members of the OPP and local heavy tow operators, profiling their efforts during events and routine operations on Highway 401, a freeway that crosses southern Ontario. In the Canadian horror film Pontypool, the OPP is called into the eponymous town to control a zombie outbreak, ultimately resulting in a massacre. The response of the government to this outbreak draws many parallels to Canadian separatist movements. The film's lead character, Grant Mazzy, vocally denounces the OPP's actions on the radio. In the television series Cardinal, the OPP is fictionalized as the Ontario Police Department (OPD), with a shoulder patch similar to that of the actual OPP except that the top element is replaced by three stylized maple leaves on a branch. OPP cruisers in the series are marked similar to actual cruisers, however the Queen's crown is replaced with a stylized beaver, and the vehicles are marked "O.P.D." versus "O.P.P." The Caledonia Land Dispute began in 2006 when members of the Six Nations of the Grand River began an occupation of land that they believed belonged to them, in order to bring light to their land claims, and to the plight of aboriginal land claims across Canada. The land at the centre of the dispute was owned by a corporation planning to build a subdivision known as the Douglas Creek Estates. The Ontario Provincial Police was called in to keep the peace. Tensions led to violence and over the span of several years, the Ontario Provincial Police was criticized for perceived inaction against the native protesters by local residents. In 2011, a class-action lawsuit against the government of Ontario was settled. In 1993 an Ontario Divisional Court case, John Doe v. Ontario (Information and Privacy Commissioner), Judge Matlow of the Ontario Divisional Court, suspected that four officers of the Toronto Police Service engaged in a fabrication of evidence and harassment of an accused party. Judge Matlow under the Ontario Freedom of Information and Protection of Privacy Act (FIPPA), sought access to the report of the Ontario Provincial Police exonerating the officers, but was denied access to it by the OPP. Access was later granted by the FIPPA commissioner, but a judicial review of the FIPPA commissioner's order to release the report resulted in publication of the OPP report being banned. The OPPA was established in 1954 to represent sworn and civilian members of the OPP, as well as OPP retirees. In March 2015, the Royal Canadian Mounted Police announced they were investigating fraud allegations against three top executives of the OPPA. ^ "The OPP Museum - Historical Highlights of the Ontario Provincial Police". Ontario Provincial Police. Archived from the original on 2012-03-25. Retrieved 2012-06-19. ^ a b c d Ontario Provincial Police. "2008 Provincial Business Plan" (PDF). Archived from the original (PDF) on August 6, 2009. Retrieved 2009-04-17. ^ "Office of the Commissioner". Ontario Provincial Police. Retrieved 2019-04-09. ^ "Ontario Provincial Police Detachment List". Ontario Provincial Police. Retrieved 2014-01-19. ^ "Ontario Provincial Police". www.opp.ca. Archived from the original on 2016-09-24. Retrieved 2016-05-24. ^ "Draganfly Innovations Inc". www.draganfly.com. Archived from the original on 2012-03-14. ^ "Sgt. Pepper's iconic photos reveal OPP badge on Paul McCartney's uniform - Toronto Star". Archived from the original on 2017-06-29. ^ "OPPA - OPP Association History". www.oppa.ca. Archived from the original on 2015-04-02. ^ "'Unusual transactions' in OPP union funds among allegations against top execs". 13 March 2015. Archived from the original on 14 March 2015. Higley, Dahn (1984). O.P.P. : The history of the Ontario Provincial Police Force. Toronto: Queen's Printer. ISBN 0-7743-8964-8. Barnes, Michael (1991). Policing Ontario: The OPP Today. Erin: Boston Mills Press. ISBN 1-55046-015-3. Maksymchuk, Andrew F. (2008). From MUSKEG to MURDER: Memories of Policing Ontario's Northwest. Trafford Publishing. ISBN 978-1-4251-7089-9. Maksymchuk, Andrew F. (2014). "Champions of the Dead": OPP Crime-fighters Seeking Proof of the Truth. FriesenPress. ISBN 978-1-4602-4828-7. Wikimedia Commons has media related to Ontario Provincial Police. Road Watch, was started by the Caledon, Ontario Provincial Police detachment.